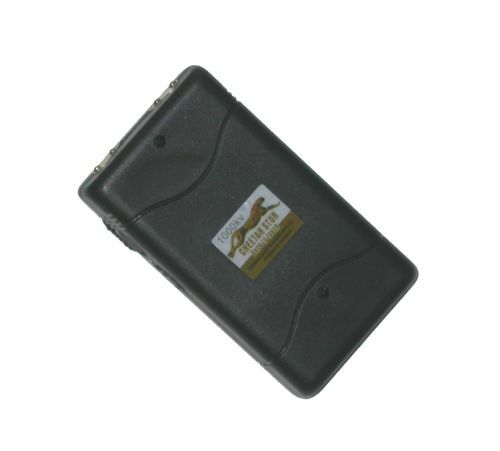 Cheetah Stun Gun With Rechargeable Battery & FREE Saftey Pin. Free holster included with belt loop. World's Strongest Mini Stun Gun. Just test firing this stun gun into the air is often enough to stop an attacker. As the bright electric current pulsates between the test nodes and creates a strong electrical sound, any attacker will stop in his tracks. If the sound doesn't stop them, this rechargeable mini stun gun will. When an attacker is touched by the very powerful rechargeable cheetah mini stungun, it will stop anyone. Only 3 to 5 seconds will deliver a high voltage shock causing loss of balance, confusion, and disorientation bringing the them to their knees. Full recovery takes about five to ten minutes and there is no permanent harm. No batteries needed, just plug it to the wall outlet to recharge. The ground breaking design of the Cheetah Stun Gun enables 1,000,000 volts to fire out of a stun gun that is so small it can actually be concealed inside a pack of cigarettes. Traditionally, the higher the voltage of a stun gun the larger the unit had to be. This is because they are normally powered by 9 volt batteries and the higher voltage units required three or four batteries. Our Price: FREE shipping for all US states.